It is important for students with disabilities who plan to attend college, and their parents, to understand how their legal rights related to their disability will change in a post-secondary education environment. In public elementary and secondary schools, students with disabilities may receive services under the Individuals with Disabilities Education Act (IDEA) or the Rehabilitation Act of 1973. The IDEA does not apply in the workplace or in post-secondary education, so services available under IDEA, such as an individualized education program (IEP), are not available in college. However, services under Section 504 of the Rehabilitation Act may continue at the post-secondary level. First, it should be noted that while Section 504 only applies to schools that receive federal funding, most colleges and universities do, and private post-secondary schools that receive no federal funding are still required to provide similar accommodations to students with disabilities, under Title III of the Americans with Disabilities Act. Section 504 prohibits discrimination based on disability, meaning that the needs of students with disabilities must be met as adequately as the needs of students without disabilities are met. Colleges and universities must provide accommodations for students with disabilities. As a practical matter, this may include accessibility of classrooms, dormitories and other buildings; additional time on tests; substitution of some course requirements; interpreters or readers; adapted computer terminals and other services. Such services must be provided unless a fundamental alteration of the program or an undue financial or administrative burden would result. Students with disabilities going from high school to college will need to advocate for their own needs more than ever. 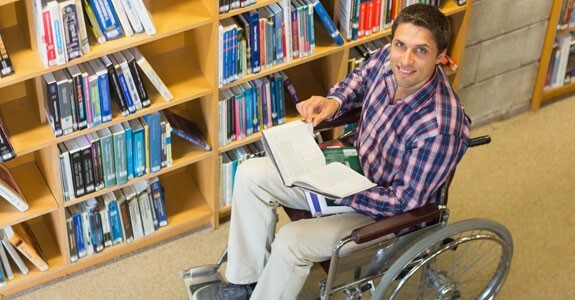 If the university has a disability support office, the student will need to make contact with that office to explain his or her needs. If a student has a history of accommodations in high school, then documentation of this should be provided to college or university officials. Most of all, students will need to be persistent, keeping a record of who they talked to, and continuing to press the matter until the needed accommodations are received. Learn more about our services at Littman Krooks by clicking here.